The Italian biographer, Giorgio Vasari called Michelangelo the pinnacle of all artistic achievement since the beginning of the Renaissance. Vasari was an astute follower of Michelangelo, publishing a biography on the artist, as well as including him in his classic work, The Lives of the Artists, in which Vasari coined the term Renaissance for the era. While best remembered for painting, such as his frescos in the Sistine Chapel, and sculpture, such as his Statue of David, Michelangelo was a near-perfect archetype of the Renaissance man as an architect, poet and engineer as well. Born Michelangelo di Lodovico Buonarroti Simoni, in the village of Caprese in Tuscany, his earliest training was under Domenico Ghirlandaio (1449 – 1494), a Florentine painter, and with the sculptor, Bertoldo di Giovanni (1435 – 1491), who was a follower of Donatello (1386 – 1466). This eventually led Michelangelo to the influential court of Lorenzo de’Medici (1449 – 1492), grand patron of the Renaissance. 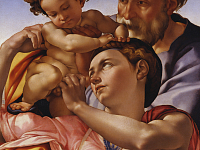 Throughout this period, in the 1490s, Michelangelo worked in Florence, Venice and Bologna. There were several works of significance, but it was in 1498 that the French cardinal Jean de Billheres (1400 – 1499), commissioned Michelangelo in Rome for the marble masterpiece, the sculpture of Pietà, a sublime work that balances the Renaissance ideals of classical beauty and naturalism. Michelangelo then returned to Florence around 1500, and in 1504 executed his most famous sculpture, the statue of David. It originally rested in the Palazzo della Signoria, outside Florence’s town hall, the Palazzo Vecchio. The statue is easily one of the most recognizable pieces of western artwork in all of history and now stands in the Accademia dell’Arte del Disegno in Florence. 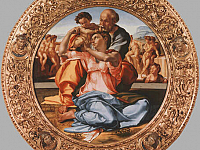 Also during this period, Michelangelo painted the Holy Family and St John, also known as the Doni Tondo or the Holy Family of the Tribune: it was commissioned for the marriage of the merchant Angelo Doni and Maddalena Strozzi and since the 17th Century hung in the room known as the Tribune in the Uffizi Gallery. Only four years later, Michelangelo was commissioned by Pope Julius II in Rome to execute frescos in the Sistine Chapel, which would become his masterpiece in painting. It took Julius II much persuasion to convince Michelangelo towards the job, the artist even fleeing the commission to focus on sculpting. Though Julius beckoned Michelangelo to return, and thankfully so, as the fresco is one of the most profound paintings ever produced. On the chapel’s wall is the famous depiction of the Last Judgment, and on the ceiling, an artistic feat of labor for Michelangelo, is the depiction of Genesis, with the iconic image of God’s hand bestowing Adam with life. In architecture, Michelangelo was commissioned by the Medici family for their tombs in the Basilica of San Lorenzo, and he began, but did not complete the New Sacristy of the church in 1520. His other major work in Florence was the Laurentian Library in the cloister of the San Lorenzo, also commissioned by the Medici around 1530. Michelangelo also had several major works in Rome, including his designs as chief architect for the Dome of Saint Peter’s Basilica.